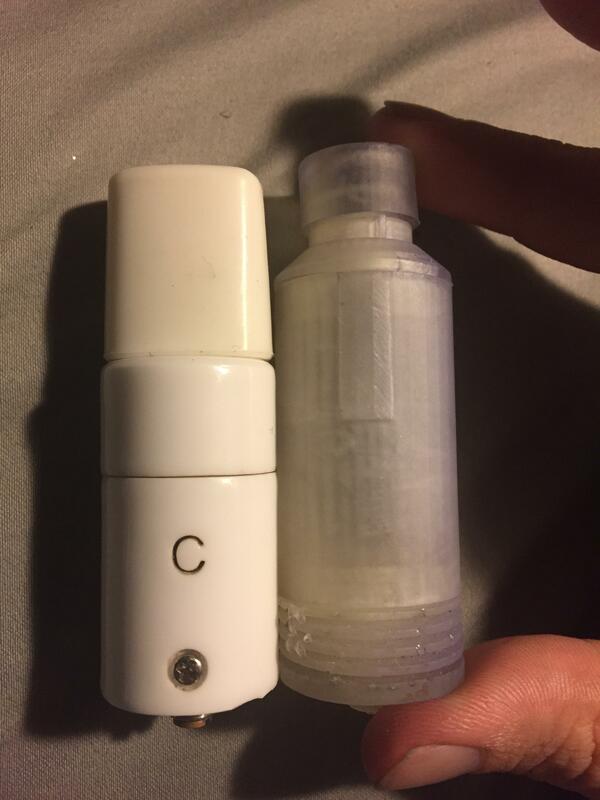 Hi FC'ers, I am in the process of developing a fully rebuildable 510 threaded attachment that will vaporize herbs via convection heating, and also vaporize concentrates directly on the heating element similar to a Sai or Divine Tribe atomizer. We Hope to launch our product by the end of the year and are about to order manufactured prototypes to test our current design. I would love to talk with the community for feedback on the product and learn how it could be improved. Once Prototyping is completed, I will be doing a beta run and aim to sell the first units to people who will experiment with different coil builds and find the most optimal configurations to be included in the retail launch. I also have a simple website available for those interested in this product to sign up via Email to be notified when ModPod fully launches. Any feedback on the website, wording, logo, and positioning are welcomed as well. Here are some renders of the current design (minor changes have been made since then, but the basic set up is the same) Our goal is to deliver a stealthy, on-demand temperature controlled convection herb vaporizer for an affordable price, and bring the innovation and modularity of the Ecig industry to the Herb vaporizer market. asdf420, MoltenTiger, SSVUN~YAH and 17 others like this. Welcome to FC. 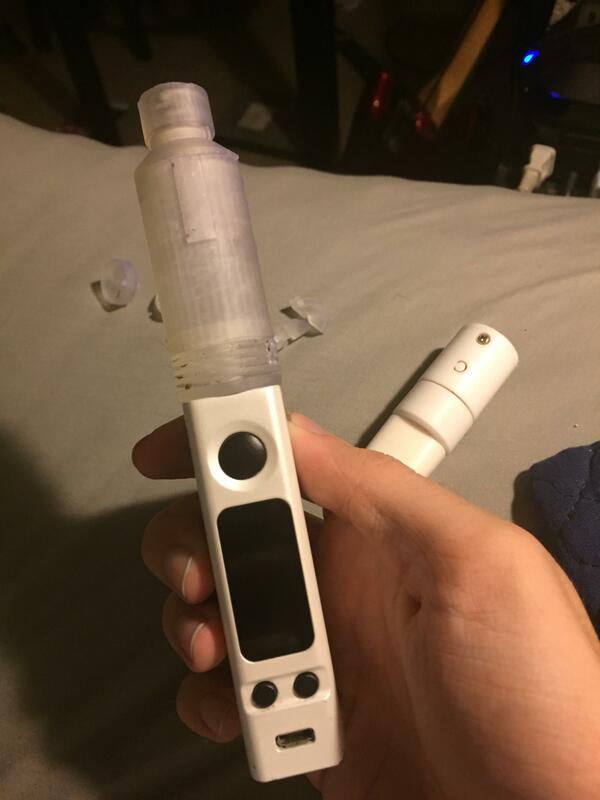 I've seen your posts about this over on Vaporents. It looks like a really cool project and I'm excited to see it develop. 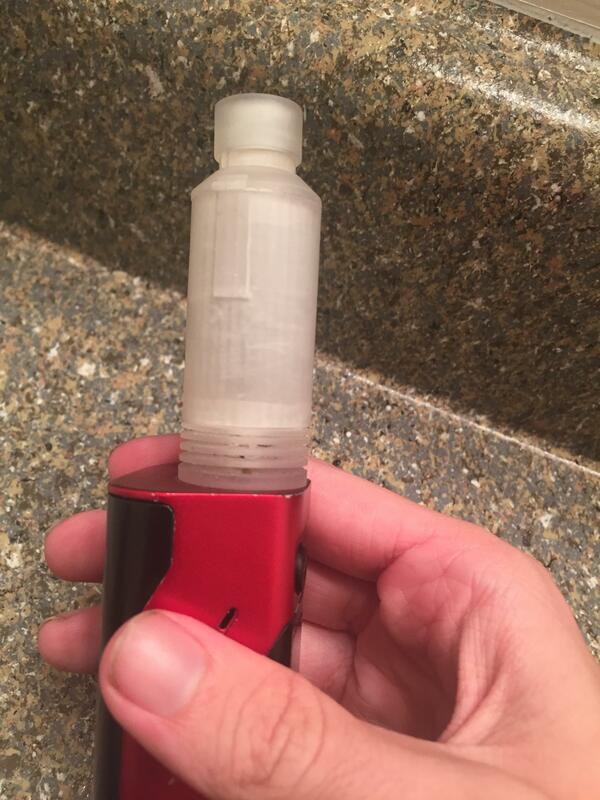 Convection dry herb vape and wax atty all in one? That's gotten me interested. I assume it's still too soon to say, but have you determined a pricepoint? AJS, Summer, StormyPinkness and 1 other person like this. Other Side, PPN, almost there and 2 others like this. Nice, I'm more of a consumer than a contributor on fc unfortunately, but I'm definitely interested in seeing more. I love double duty tools. Summer, supershredderdan and almost there like this. I am assuming the heater modules/coils will be swappable to be able to go back and forth from concentrates to dry herb. I would suggest having multiple concentrate options. 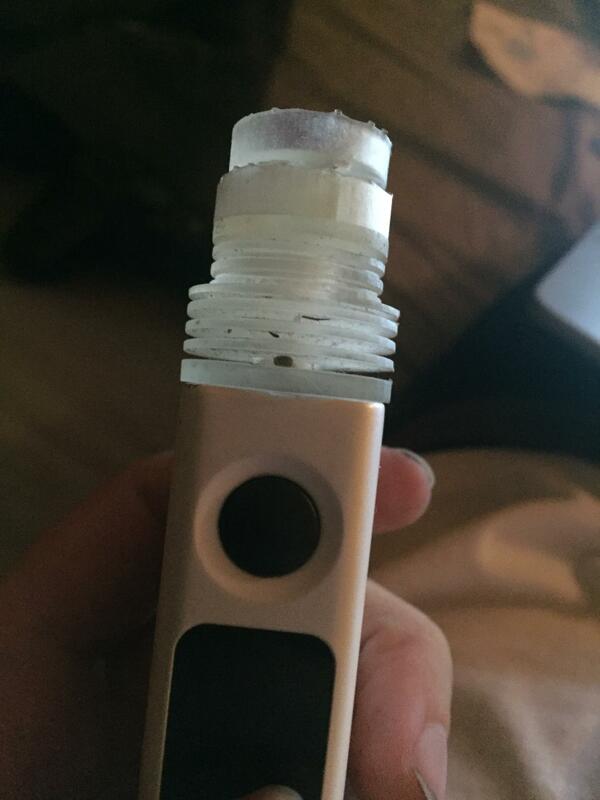 No need to go overboard like SourceVapes or W9. Maybe like 3 or 4 options...Clapton coil setup, standard coil setup and a crucible cup. Deck will be fully rebuildable so any build one could do on a postless RDA could be done here (without the need for a screwdriver or any tools) so say, SS claptons, twisted kanthal, or ceramic donut could easily be incorporated. We plan to offer ModPod coils for a low cost, but users could install or build whatever they want (and I look forward most to the creative things people come up with). 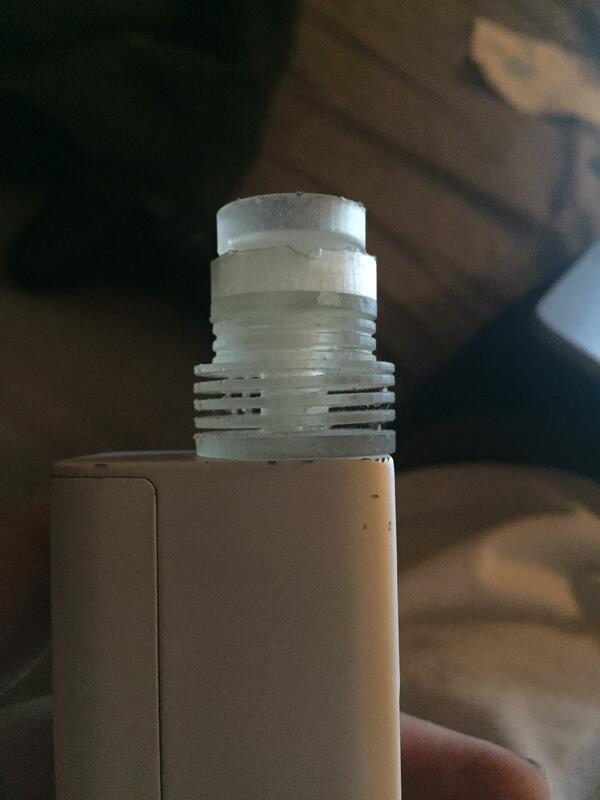 What I hope to find is a good coil that works well for convection herb heating but also works well for concentrates. Was thinking something like large thick framed staple coils with lots of holes and crevices for air to go through when convection heating, and can soak up a good amount of concentrate with a low temp melt in. Summer and StormyPinkness like this. Looking at the image it looks like a herb pod suspended over a coil. Will you be able to buy additional pods to create a fast loading system? I dont quite understand how the mouthpiece works. Is the picture on the left showing a travel cap of some sort? Will it work as a gong as well? What is the whole thing made of? I love the idea. I have a RBT splinter on pre-order, i hope to ditch all my vapes in the future and have a number of 510 attachments. TENZEN, grokit, Vape Donkey 650 and 2 others like this. Sounds interesting, quite ambitious! If you could pull it off and perfect even just one or the other, (flower or oil) you would have me wanting one. Moving the vape industry towards the direction of TC mods, accurate temps with TCR / dynamic coil resistance measuring, quick heat ups, avoiding combustion, and having modular attys, those are all features and trends I very much support! And then also pure convection in a relatively small atty that won't make your TC mod look like a long-barreled pistol also? I hope you can overcome my skepticism. TENZEN, wileycoyote1103, Hogni and 4 others like this. At the moment the cap only serves that one purpose, but I've played around with the idea of a WPA that would thread onto where the top cap normally would screw onto. We are planning to use only stainless steel, ceramic, and glass (maybe quartz) for the device, with a bit of copper for the positive post. I've seen some videos of the splinter in action and I'm very impressed with the vapor production people are getting, hopefully the sentiment that attachments are fundamentally incapable of vaporizing well without combustion will soon be a thing of the past. Also if you want to be in the beta, pm me. I'm prioritizing those with experience in making coils for this type of application, and have a healthy knowledge of temp control, PI regulation, heat distribution etc. Hogni, Summer, Other Side and 5 others like this. Divine tribe is a fantastic conduction vape. On par with a davinci IQ at a fraction of the the price. Thing is i dont like conduction vapes. I dont like the harshness or taste. If covection means the atty will be bigger i can live with that. You can always unscrew it to put it in your pocket. Getting good performance and cool vapor in a ecig tank formfactor is definitely challenging, but it is also extremely important for the overall quality of the product. We are getting creative with air/vapor paths to make sure ModPod delivers cool vapor without needing excessive length. Can't know for sure until we get models IRL, something I am discussing with my team later today. Taste is gonna be a big priority, the vapor path (if an all glass 810 drip tip is installed) will be mostly glass. size wise we choose a 24 MM base diameter, and I can't remember the exact height, but it is a few mm taller than a tfv8 counting drip tip. If enough people gripe about overhang on their favorite mods, we can see about making it 22mm, though im pretty sure the coil deck will shrink in proportion. The only thing is it will have a 1 mm overhang on devices like the evic vtc mini (personal favorite single 18650 mod) and most of the pico line. launching with two sizes is not an option financially. natural farmer, Summer, grokit and 2 others like this. I'm smitten lately with box mod dry herb atomizers...looking forward to what you put out! TENZEN, Other Side, Adobewan and 4 others like this. I would say 24mm. The splinter will be large too. 24 is the minimum that all new box mods support. Depending on materials and thickness you should be able to do at least a 20mm deck. Most 24mm rdas have 20mm of deck space with 22mm being the outside of the deck. I hope your design will incorporate a barrier directing the airflow away from the center of the bowl for even heating. Or some other creative way to accomplish it. Hogni, Summer and grokit like this. We just overhauled the design of a few pieces specifically focusing on heat distribution. We made the base of the herb pod concave, and will possibly add a metal pin in the dead center to provide some radiant heat and block air from going straight to the center. Also made drafts of 2 different internal vapor cooling units. Build deck currently is at 19 mm, but the ceramic cup that surrounds the coil is 17mm. You can run it without that cup, but it helps direct airflow a bit and is useful for concentrate coil configs. Summer and Joaon like this. Hm I much prefer side-by-side mod designs these days, especially since as said above we need much more length to cool our vapor than a standard e-cig. Unfortunately all SBS mods on the market today support only up to 23mm. And the Pico doesn't support 24mm either due to the battery cap. The Splinter will be large but this is not a selling point at all, to the contrary. Summer, natural farmer and grokit like this. 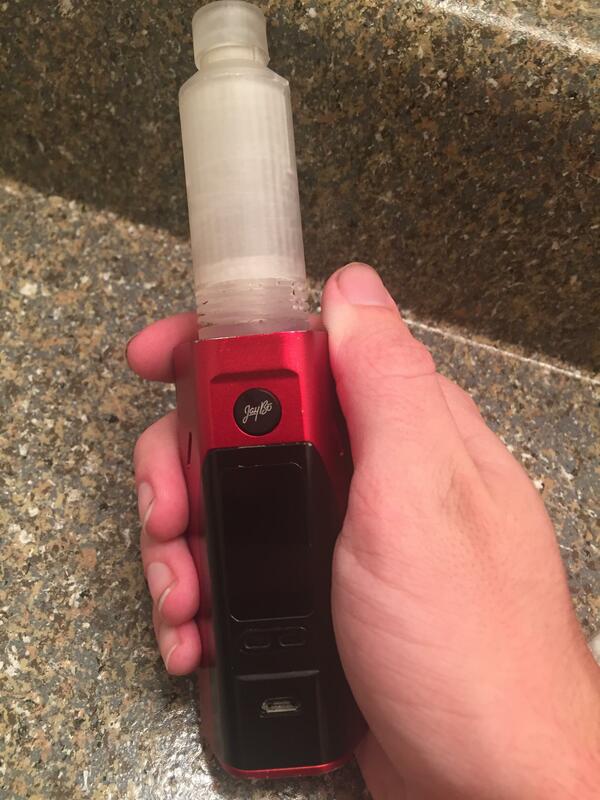 I agree on the side by side mod 100% Been looking for a duel 18650 side by side mod but can't find one. either way I agree I want side by side mod. Summer and KeroZen like this. Check out the movkin disguiser, never used it so not sure if the software is any good. Doesn't the tesla 40 support 24mm attys? I've seen a tfv8 on there before I believe it was the standard size not the baby beast. I think we are set on 24mm for now especially since there's more going on internally with this new revision. grokit and KeroZen like this. The Movkin Disguiser TC mode doesn't work very well for me... although I probably mistaken something but I can't find a way to set the TCR... user guide is very basic and I didn't took the time to look at the reviews... I bought it to use it with my SR-74 in power mode but , lately, I used it a lot with my DT Gen2 Herb atty (sadly it's not possible to hide the atty here...). Is there any space between the outer shell of the DT and the wrap around of the Disguiser? ModPod will only be 1 mm wider from the center. Actually I use it on the top of the unit using the provided adaptater. Just checked the Gen2 and it fits the Disguiser without adaptater but without the mouthpiece too, which can't fit the cover hole which is 1.6cm diameter. And there is enough room for your ModPod since there is 2-3mm more but your mp might to be 1.5cm at max to fit the cover hole, and round shaped. Here are some pictures of 3D printed dummy models with size comparisons. Also put the model on an Evic vtc mini to see how the overhang looked. What do you guys think? Internally there have been a few changes, but the exterior profile will be the same. I'll have more on the recent design changes by tomorrow. Hogni, Summer, grokit and 5 others like this. Size looks fine. You don't really notice the overhang. There does not look like much room for a coil in the base. What height clearance do u have for a coil? Am I right in thinking the herb pod is made of glass or ceramic so non conductive? What type of coil did you have in mind? There does not look like much room for a coil in the base. What type of coil did you have in mind? The idea is out there to order two sizes of herb pods with the prototype, one about this size (similarly sized herb containers are rated about .3) and another that is the same diameter but not as long, to accommodate to vertical coils a la "the project"
For the herb pod pictured in the 3D print, I imagine single or dual stovetops, staple coils wound in flat oval for max surface area, and maybe tornado coils that would extend up near the sides of the bottom of the herb pod. Or did you mean the diameter in the coil cup? the diameter is 17.5 mm which is pretty large as far as herb and concentrate attachments. I will try my hand at making these coils myself, but I don't consider myself an expert coil builder by any means, that's why I'm really looking forward to what people in the beta come up with. When we decide on a good design or two, I'll look into ways of mass producing that coil, either automated or done by the builder in bulk quantities for a fair price. I would love to partner up with any skilled creators when we get to that stage. Hogni, Summer, GreenHopper and 2 others like this. and this is the modular base that the pods attach to? also the convection heaters too? 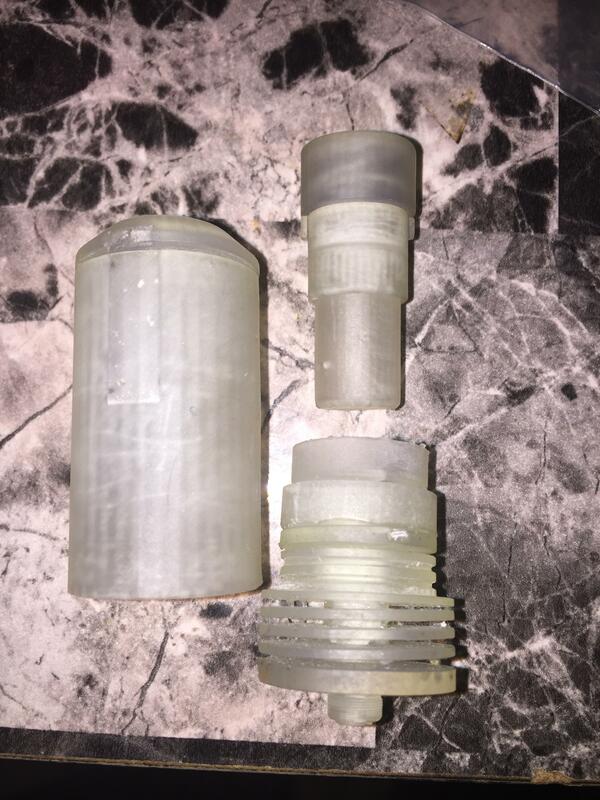 this looks like a base, an atomizer coil / pod of some sort, and a cover? Overall, the size and form looks nice, I was expecting some comically long sr-74-ish thing. It's barely longer than the DT Gen2 herb. You wouldn't even really need / want a recessed tank mod to go with that. Rasputin, Hogni, Summer and 3 others like this.